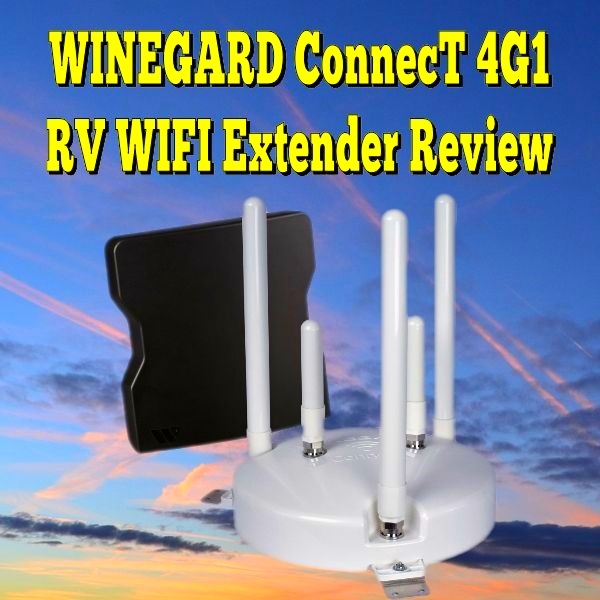 Recently I was contacted by WINEGARD and asked if I would be willing to test and review their new WiFi antenna system called the ConnecT 4G1 WIFI Extender. I agreed and they sent me a unit to test and review. Below are the results of my review. Just a head's up here, this review is quite long. I have added some links below to get you to different parts of the review. But if you want to live dangerously you can just scroll down and read the whole thing. I need to start off by saying that the hardware installation process was well explained in the included Owner's Manual. The outdoor antenna unit is required to be installed in an area on the RV roof that is at least 1 foot away from the edge of the RV's roof and at least 2 feet away from the front of the RV and at least 2 feet away from any other antennas or equipment on the roof. It also states that the outdoor antenna unit should be installed so that the Ethernet Cable on the outdoor antenna unit faces the rear of the RV. Just a note here, you are going to have to drill a hole in the roof of the RV to run the Ethernet cable to the Indoor Unit. 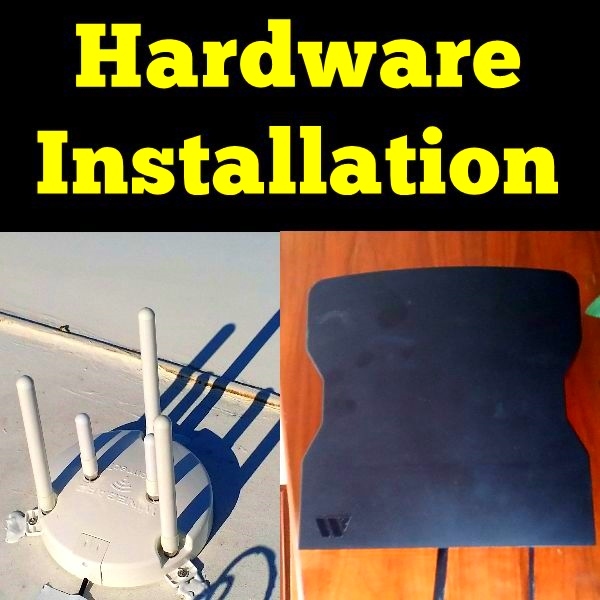 Once you have the outdoor antenna unit secured to the roof, it is time to install the 3 WiFi antennas and 2 4G LTE antennas on the outdoor antenna unit. All 5 antennas are made of hard plastic-like materials and have no flexibility whatsoever. This could be a problem if you hit low tree branches. There is a chance that the whole unit could be torn off of the roof of the RV. The hardest part of the whole installation for me was finding a spot on my RV's roof that met the 1 and 2 foot distance rules. Between solar panels and a crank up TV antenna and Satellite Dish, I am running out of real estate to install anything else. The main thing to remember about connecting the Ethernet cable on the indoor unit is that there are two Ethernet connections one can be used to plug in a computer and is labeled as Ethernet, the second connection is a powered Ethernet connection and is labeled as "POE" this is the one that the Ethernet cable from the outdoor antenna unit needs to be plugged into. Step-by-step on screen instruction makes setting up a breeze. Anyone can do it! Scan for and select WiFi network. Connect your WiFi devices to your new extended network instantly. 4G models connect to 4G LTE when WiFi is not available. Easily connects your mobile devices, smart TVs, and gaming controls. The ConnecT 4G1 WIFI Extender Owner's Manual comes with very clear and concise Instructions on how to log on for the first time. That being said I did encounter some problems when I first tried to log in. Now to be honest this may not be a problem with the ConnecT 4G1 system, it may have actually been a problem with the laptop I was using. Once you turn the unit on you need to use your browser to logon on to the setup screens. It took about 1/2 hour for my laptop to show that logon page as active, but once I was logged in I could browse through all of the setup pages. Once the unit is setup, it can be turned off, but be aware that it takes about 5 minutes for the unit to reboot and for the WIFI connection to show up as a WIFI source to connect to on your devices. The reason I know this is because I shut down the indoor unit and rebooted it and spent several minutes waiting for the WIFI connection to show up on my laptop. So learn from my mistake. This was not a problem with the unit it was a problem with the user. The owner's manual recommends that you use either Chrome or Firefox for the setup process. Once the unit was setup using Chrome, I was able to use Window 10's Edge Browser to access the setup pages, I am not sure if this interface also works on Internet Explorer. When I first read about the WINEGARD ConnecT 4G1 WIFI Extender I thought that it automatically switched to 4G/LTE when WIFI was not available, but it does not. You have to manually choose either WIFI or 4G/LTE. This is actually a good thing, for example if you are at an RV park and you accidentally leave your device connected to WIFI and the RV Parks WIFI goes out and the unit automatically switches to 4G/LTE and some of the software you use decides to do a major software update. You could wake up and realize that you have you used all of data available on your Data Plan, just saying. You can subscribe to or renew a 4G/LTE data plan. You can also see what percent of your plan is left and how much data was used or is remaining on your current plan. Even though the WINEGARD ConnecT 4G1 WIFI Extender performed extraordinarily well during my testing. It's downfall could very well be its Data Pricing Plan. You only have one provider choice and in my opinion the pricing is quite unreasonable. To top it off the data you purchase expires 30 days after you purchase it, so if you don't use it you lose it. 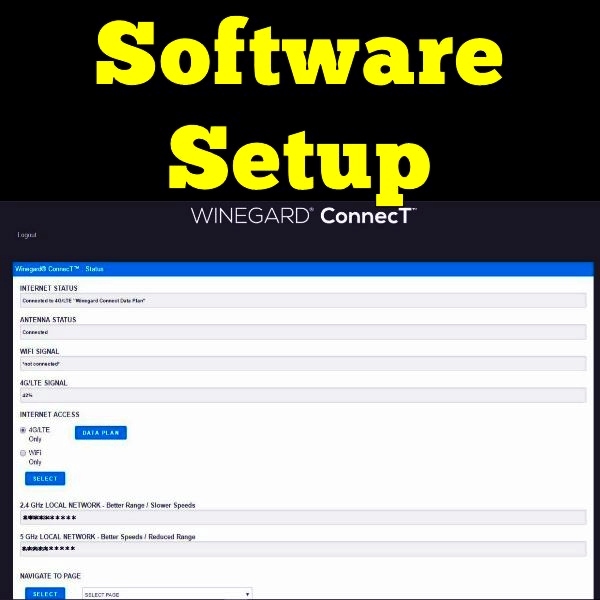 On this page you can download the latest software version of the WINEGARD ConnecT 4G1 WIFI Extender or install an update from your computers hard drive if you do not have a WIFI connection. About 10 minutes into setting up my inside unit, I decided to download the latest version of the operating software. When I looked up my data plan, it did not show the 10 GB plan that my test unit was suppose to have. But I still tried to use 4G to download the update and after 5 tries the update was downloaded and when I installed the update, my data plan information showed up and some minor glitches also cleared up, but again some of the glitches that I experienced could have been due to the laptop I was using. This page gives you several ways to contact Winegard if you are having problems with your unit. It also allows you to save a log file. The about page includes information about your particular unit including software version numbers, bootloader version number, serial numbers for both the outside and indoor unit, MAC Adresses, etc. The bottom line for this section is that Winegard lives up what they say about the installation and setup of the ConnecT 4G1 WIFI Extender. The Owner's manual contains clear and concise instructions to get everything up and running. My biggest complaint in this section is the data plans being overpriced and losing all remaining data after 30 days. Always secure. Set-up your secure network once and you are done. ConnecT Advanced WiFi protected access (WPA and WPA2 – PSK). Guest Network Access – separate and secure. All I can say is that Winegard has done a great job of securing your data with a dual firewall, Denial of Service Protection and choices of several WIFI data security protocols you can choose from. Guest access is available and it will not allow your guests to access your setup screens. It is disabled from the factory and you can turn it on if you want. By the way it uses a separate password that you create. The bottom line for this section is that the ConnecT 4G1 WIFI Extender is safe and secure right out of the box. So all expectations are met. Increase the range for mobile devices inside your RV. Multi-user MIMO-ready for faster performance to each device. Powerful amplifier and three high performance external antennas increase WiFi range. Easily connects all your devices to secure WiFi in seconds. Nationwide 4G LTE coverage provides consistent, in-motion connection with the ConnecT 4G1. I get a lot of questions from RVers on how they can improve the WIFI reception in their RV. Part of the problem is that you are using a smart phone or computer inside of an RV which in a lot of cases is constructed with materials that effectively block the WIFI signals from entering the RV. Depending on the age of your RV, you could have older appliances and equipment that can directly interfere with the WIFI signals that do make it into your RV. Does the ConnecT 4G1 WIFI Extender solve these problems? Yes, and it does it better than any other device that I have personally used and recommended to other RVers on Everything About RVing to improve the WIFI strength and range. Read on to learn how well it did in my tests. The first thing I did was connect my Laptop to ConnecT 4G1 while it was setup to run on 4G. We went to an RV park that I know has poor 4G and poor free and paid WIFI signals, I will tell you that we frequent this RV Park a lot and I have unsuccessfully tried on numerous occasions to use my smart phone as a hot spot due to the poor WIFI, without much success. I could connect to my smart phones hot spot but the laptop was virtually unusable. What a different experience I had once my laptop connected to the ConnecT 4G1. Even though the 4G1 showed that the 4G/LTE signal strength was only at 42% I was able to stream both Netflix and Amazon Prime videos without any stuttering or buffering with very good video definition. I even used an HDMI cable and hooked my laptop to our 42" TV and it still looked very good. This was also happening while my wife was browsing the internet on her tablet. Just so you know there was nowhere that we went that the ConnecT 4G1 did not have a strong 4G signal, always above the 42% low we experienced in the 4G WIFI hell RV park, that includes while traveling down the road and yes we could even stream Netflix going down the road. I would not recommend doing this as the data usage could cost you a lot of money. This is where the ConnecT 4G1 shines. The three WIFI antennas on the unit are very good at picking up weak WIFI signals and the built in signal amplifier even makes the weakest signals usable. This unit came very close to changing The WIFI Hell RV Park into a WIFI heaven. As I stated earlier this RV Park has both free and paid WIFI all barely transmitted throughout the park. When I tried to connect my laptop to the free WIFI, it had a signal strength of 31%. When I connected the ConnecT 4G1 to that same WIFI, the signal strength increased to 78%. Of course the first thing I tried once I connected was to stream a video from Netflix, the video streamed with no stuttering but the resolution was very low. But, the free WIFI worked quite well for normal browsing and e-mail usage. I decided to live dangerously and pay the $5.99 for the the 24 hours use of the faster internet. The signal strength remained the same, but I was able to stream Netflix at very high definition and was also able to play it on our TV with good visibility. The other RV parks that we used this at all had much better signal strength but even the other ones we used showed an average 20% increase in signal strength. One in particular systems at one of our favorite parks showed a 79% signal strength on my laptop. When it was run through the 4G1 the signal strength fluctuated between 98% and 100%. I am sure some of you are wondering why I use streaming Netflix and Prime Videos to determine how fast my internet connections are. Yes, I know that there are websites you can use to "Speed Test" your internet connections. My reason for not using them is depending on where they are and where you are they are not always accurate. I use the internet for working on my website and occasionally for entertainment purposes when we are out RVing. When I stream a video, I can immediately see if my connection is good for what I need. If the video does not skip, stutter or continually buffer and it has good resolution, then I know that I have a good usable connection. Not very scientific I know, but it works for me. 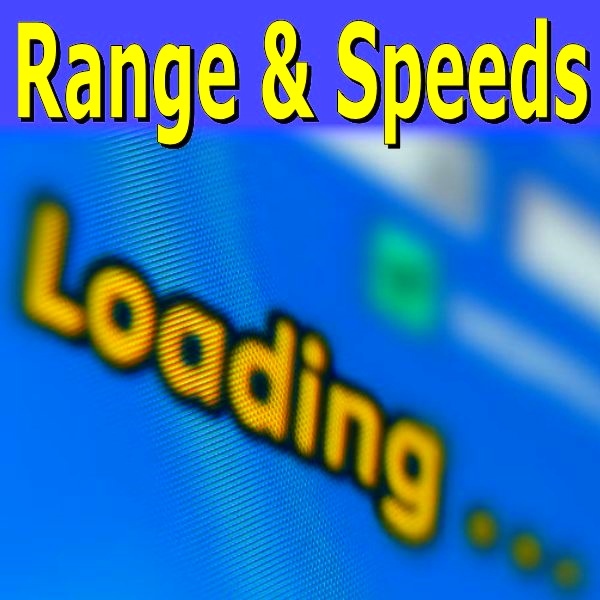 The bottom line on Increased Range & Speeds: From my experience I can tell you that the WINEGARD ConnecT 4G1 WIFI Extender can greatly improve WIFI speed and that it has met or exceeded all of Winegards claims of increased range & speeds. The score above is based on my use of the ConnecT 4G1 WIFI Extender for the past several weeks. Listed below are the Pros and cons of this unit. The WINEGARD ConnecT 4G1 WIFI Extender does greatly improve WIFI speed and range. It has met or exceeded all of their claims of increased range & speeds. Winegard has done a great job of securing your data with a dual firewall, Denial of Service Protection and several choices of WIFI data security protocols you can choose from. The installation of the Outdoor and Indoor units is quite simple and straight forward. All directions in the Owner's Manual are quite clear and very concise. You only have one provider choice and in my opinion the pricing is quite unreasonable. Loss of all remaining data 30 days after plan purchase date. All 5 antennas are made of hard plastic-like materials and have no flexibility. This could be a problem if you hit low tree branches. There is a chance that the whole unit could be torn off of the roof of the RV. It took several attempts to download the software update. Of all of the cons listed above, redesigning the Data Pricing Plan would go a long ways in making the ConnecT 4G1 WIFI Extender a great buy for RVers who want to greatly improve their WIFI reception. For more information on the WINEGARD ConnecT 4G1 WIFI Extender, you should visit The Winegard ConnecT Page.